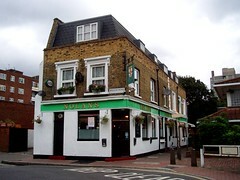 A locals' pub just south of Vauxhall Station, in an area of estate shops between South Lambeth Road and Wandsworth Road. A long, thin pub, this one stretches back from its street entrance, up a few steps to a spacious back area, where a darts board dominates the area. The bar lies between these two areas along the west wall, with pumps at both the lower and upper levels. There are a couple of additional doors along the side of the room, opening out onto a pedestrian passage serving the local estates. The front area has a pool table and is not as brightly lit as the back. The dart board takes pride of place, and there's a proper oche for the players to stand at. It appears that darts competitions take place on a regular basis, and one such was planned for the Monday evening Ewan and friends visited. Service here is perfectly friendly. Locals take up positions around the back room, chatting away and practising their darts. There are four handpulls on the bar, but none appear to be functioning. However, for the ale drinkers they have several bottles behind the bar, mostly various types of Bombardier (£2.20/bottle), as well as Jenning's Cumberland Ale. Basic lagers are on draught, including Stella, Beck's and Foster's. A jukebox is available, and the bar staff occasionally put music on. It's a pretty decent selection, and they were playing mostly classic rock, soul, et al., on our visit. Last visited by Ewan, Laura and others, 12 January 2009. Last edited 2009-01-14 23:07:17 (version 3; diff). List all versions. Page last edited 2009-01-14 23:07:17 (version 3).